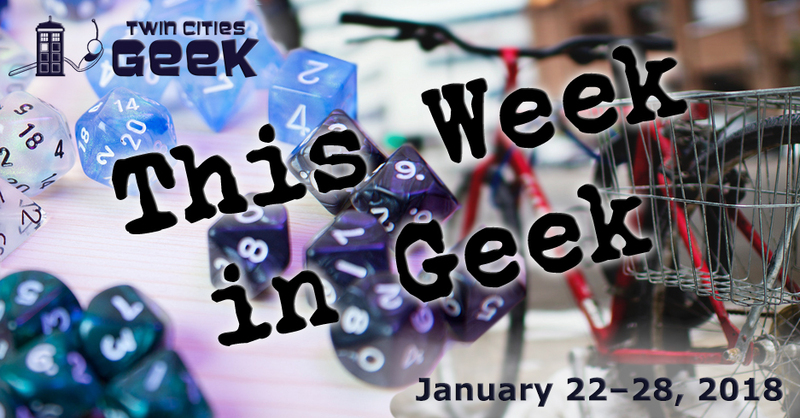 Welcome to This Week in Geek, your guide to events of interest to the Minnesota geek community for the week of Monday, January 22nd to Sunday, January 28th. When: Monday, January 22nd at 7:00 p.m. When: Tuesday, January 23rd at 7:00 p.m.
Come and experience YogaQuest, a blend of yoga and fanfiction storytelling led by certified yoga instructors. Experience a yoga workout experience and a story at the same time. This week’s theme is Guardians of The Galaxy, so surround yourself with your favorite trash pandas and talking trees. This event costs $15. Enjoy a night of community and tea with Tea and Meeples, a weekly gathering of friendly geeks at “Panda Castle” in Richfield. Cozy up for the winter and enjoy some reading and company. When: Wednesday, January 24th at 7:00 p.m. When: Thursday, January 25th at 6:30 p.m. When: Thursday, January 25th at 7:00 p.m. When: Thursday January 25th at 8:00 p.m.
GLITCH will be hosting 200-plus game designers, writers, artists and developers from around the Midwest this weekend who will be taking part in the Global Game Jam, and that could include you. This is an intense event where you will work with a team to develop a game in 48 hours. See the website for more schedule-related details or click here for our article about last year’s Gamecraft. Tickets for entry are $30 ($25 for students), and all skill levels are welcome; January 21 is the last day to preregister, but you can still register at the door. When: Friday, January 26th at 1:00 p.m.; Saturday, January 27th at 9:00 a.m, Sunday January 28th at 10:00 a.m.
Minnesota is a state of extreme weather, and the ingenuity involved in surviving that weather and dealing with all the snow can be quite geeky. The Autonomous Snow Plow Competition, part of the St. Paul Winter Carnival, is a competition testing the ability of robotic plows to clear snow and involves teams from nearby schools trying to clear snow with the latest and greatest in automated navigation systems. When: Friday, January 26th at 6:00 p.m.
Community Grounds coffee shop in Columbia Heights presents a night of trivia all about Disney/Pixar films. Play solo or with an an incredible group of friends who will lift you up. This event is free, and prizes and prizes are available. When: Friday, January 26th and Saturday, January 27th at 7:00 p.m. and 9:00 p.m.; Sunday, January 28th at 6:30 p.m. and 8:30 p.m. The classic Dr. Strangelove is a pitch-black satire of the Cold War, mutually assured destruction, and the government. The Trylon will be screening his film throughout the weekend; tickets are $8, but you have to bring your own precious bodily fluids. When: Friday, January 26th at 8:30 p.m. When: Friday, January 26th at 9:30 p.m. The City of Lakes Loppet is the Urban Cross Country Ski Festival, an opportunity to see a variety of winter sports and enjoy a warm sense of community in the cold. This event will include a variety of races throughout the day, vendors, Kubb tournaments, a beer garden from Surly Brewing, and more. See the event page for schedule details. Venture onto the ice for this annual adventure and experience an eclectic mix of art installations, performances, games, activities, and more. Per the event organizers, the easiest way to reach the shanties is walking out onto the ice by the Lake Harriet Bandshell. The 27th and 28th are youth and family weekend, and a few highlights include a kite festival, a giant frame, and a notary public. When: Saturday, January 27th at 7:00 p.m. Solve the classic geek question of space wizards in constant war versus utopian exploration once and for all with a night of galaxy-spanning burlesque. Tickets much be purchased using 21st-century earth money and are $18 in advance or $20 at the door. This is an 18-plus event, so Wesley Crushers and younglings will have to say at home. When: Saturday, January 27th at 8:00 p.m. Enjoy a “Mad” night as Geek Slink and Drink presents Thunderdome, a night of belly-dancing, twists, turns, and surprise performances. Tickets are $15 at the door or $12 in advance. Performers will be facing off and taking on the challenge of the wheel. You don’t want to miss this night of fun and potential prizes. When: Saturday, January 27th at 11:59 p.m. When: Sunday, January 28th at 12:30 p.m. Gender Jam, a meetup group for trans, gender-nonconforming, questioning, and intersex youth, will be having an afternoon of fun at Dreamers Vault Games. Meet at the Exchange to catch a ride over, then enjoy and afternoon of gaming, comics, and company. As always, bring your permission slip if you are under 18. When: Sunday, January 28th at 12:00 p.m. When: Sunday, January 28th at 1:00 p.m.
Get your ’80s cartoon roleplaying action in with Masters of Umdaar, a Fate Accelerated game meant to pay homage to Masters of the Universe. This is a great chance to learn Fate Accelerated, or see how it handles this particular genre. This is a free event, but the organizer does request that you RSVP ahead of time.